While this luxurious resort, located on Maui's sunny southern shore, has much to offer, many feel that the sumptuous, 50,000-square-foot, aptly named Spa Grande rates as a destination in and of itself. Though this full-service facility has 40 treatment rooms, the spa prides itself on its very personal services. Its separate bathing areas for men and women, illuminated by natural light through windows of thick glass brick, are where one experiences the unusual range of healing water options that are a highlight of the huge spa services menu. Spa Grande is an oasis of wellness and relaxation located within the renowned Grand Wailea resort. Spa Grande features a myriad of water therapies in the Healing Waters of Maui Hydrotherapy terme including a large Roman whirlpool tub, 2 cold plunges, a bubbling Japanese Furo bath, three cascading waterfall showers, sauna, Eucalyptus steam room, tropical showers, and the 5 signature Healing Waters of Maui baths. Each guest who indulges in a 50 or 100 minute spa service, will recieve one hour complementary prior to service to soak in the hydrotherapy terme. The Healing waters of Maui terme experience also includes the Spa Grande honey mango loofah scrub. Spa Grande offers over 100 treatments, which include salon services, massage, facial and body therapies. Among the most popular treatments are the Pala’au journey, and the Macadamia Nut indulgence. 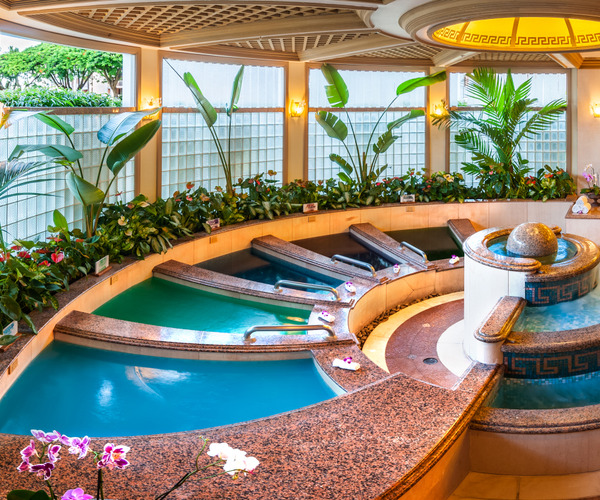 These treatments give guests the true Hawaiian spa experience. Guests staying at the Grand Wailea Resort will have access to the state of the art fintness center. Group classes and personal training are available to all guests, and private group classes are also available. We accept Spa Wish cards. The water features are a main attraction of the resort. The 2,000-foot-long, 25,700-square-foot Wailea Canyon Activity Pool consists of nine free-form pools at six levels, from 40 feet to sea level. It includes waterfalls and slides, caves, rapids, a sand beach, three whirlpools, even a baby beach and infant pool, and more. The 4,850-square-foot Hibiscus pool, decorated with millions of pieces of tile, is for guests l8 and older. Ocean water sports are offered and boogie boards, kayaks, Hobie Cats, and snorkeling equipment can be rented. Another major attraction is the Wailea Golf Club, which offers a choice of three championship courses: The Blue Course, designed by Arthur Jack Snyder, and the Gold and Emerald Courses designed by Robert Trent Jones, Jr. Kids 5 to 12 will love Camp Grande, their own 20,000-square-foot mini-resort with a movie theatre, Nintendo game room, indoor play area, and more. Grand Wailea's concierge can make arrangments for the following activities on Maui: snorkeling and kayaking, biking, and whale watching, as well as tennis and helicoper rides. All 776 guest rooms and suites are especially spacious, with sizes from 640 square feet on up. Your room's private lanai (balcony) may overlook lush tropical gardens, Mount Haleakala, rows of striped cabanas, and the ocean beyond. Napua Tower is an exclusive private club area situated at the center of the hotel and featuring a dedicated concierge with upgraded guest room accommodations. Guests have access to a private lounge where a complimentary continental breakfast and evening cocktails and hors d'oeuvres are served. For evening dining, you can visit the romantic, exotic oceanside Humuhumunukunukuapua'a (named for the state fish) that floats above a lagoon and features Hawaii Seasonal Cuisine. Guests may breakfast at the Grand Dining Room, which offers a panoramic view of the pool, ocean, and nearby islands; enjoy casual California and island specialties at Bistro Molokini at lunch and dinner; dine on light fare at the Cafe Kula on the terrace; and enjoy salads and sandwiches for lunch at the poolside Volcano Bar. There are also multiple lounges located throughout the resort.